Powers/Abilities: Bill's street clothes are rigged so that they can transform at the pull of a hidden cord into his King Cobra outfit; his hood is a separate headpiece he needs to don. All of King Cobra's powers originate from his high-tech suit. 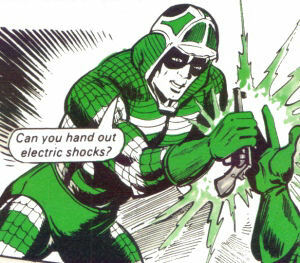 Among them are an inflatable hood that allowed him to fly, gauntlets that generated electrical shocks, a spotlight in the helmet, and nylon wings which allow him to glide. He can make the suit's skin as smooth or rough as he likes, protecting him from sharp objects and bullets, and allowing him to scale walls. 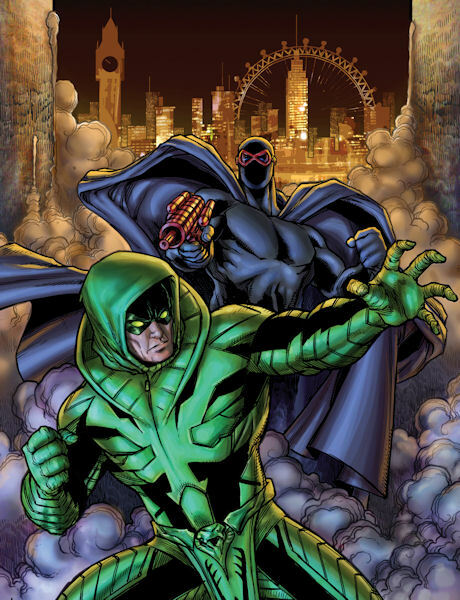 His hood contains hidden jets that can spray a powerful knock out gas, swiftly rendering opponents unconscious, and his gauntlets boost his strength sufficiently that he can stun a grizzly bear with a punch. History: Bill King was the best crime reporter the Daily Scene newspaper had, but he led a secret double life. Because criminals had ruined his scientist father's career and caused his death as a result, King waged his own war on crime. Using his father's inventions, King created a snake-like battlesuit and became King Cobra, enemy of the underworld. In his heroic identity he took on a variety of colourful foes, including Diablo and a King Cobra impostor wearing a second rate knock-off of his own costume. (Untitled, Hotspur Annual 1979.) While touring the American West King Cobra foils an attempt to force the sale of a wilderness park by thugs who are arranging "accidents" to the visitors there. (Untitled, Hotspur Annual 1984.) When an impostor blackens King Cobra's good name, the hero tracks down the fake and arranges to capture him in the middle of a robbery attempt, clearing himself. (Untitled, Hotspur Annual 1985.) King Cobra thwarts an attempt to murder the director of a top new movie. 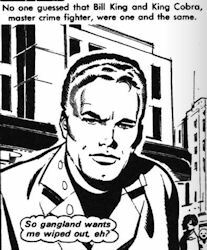 Comments: Ron Smith (who also drew Judge Dredd, Nick Jolly and Red Star Robinson) was responsible for much of the art for this character. Thanks to Jim Croasdale for additional information on the artist for this character. 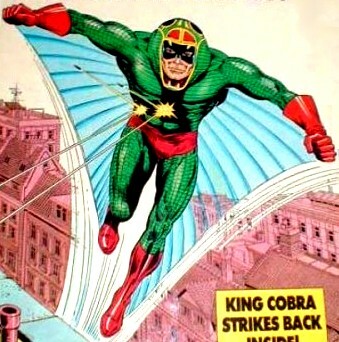 King Cobra was briefly revived twice in 2013. In Strip Magazine, he was apparently the late Bill King's successor, rather than Bill himself. 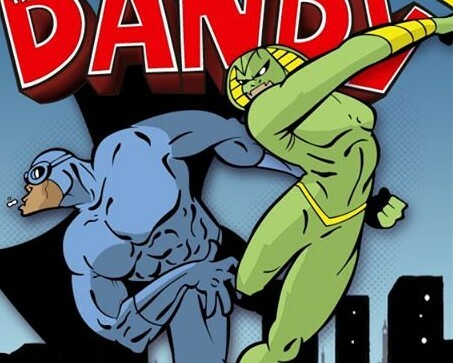 The other revival was in the now Dandy's all-too brief digital run, where he turned up as a member of the team Retro-Active. 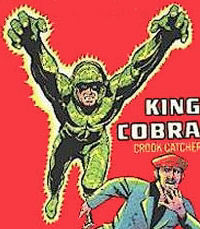 King Cobra, who faced secret agent Barracuda in the Lion magazine in the sixties.